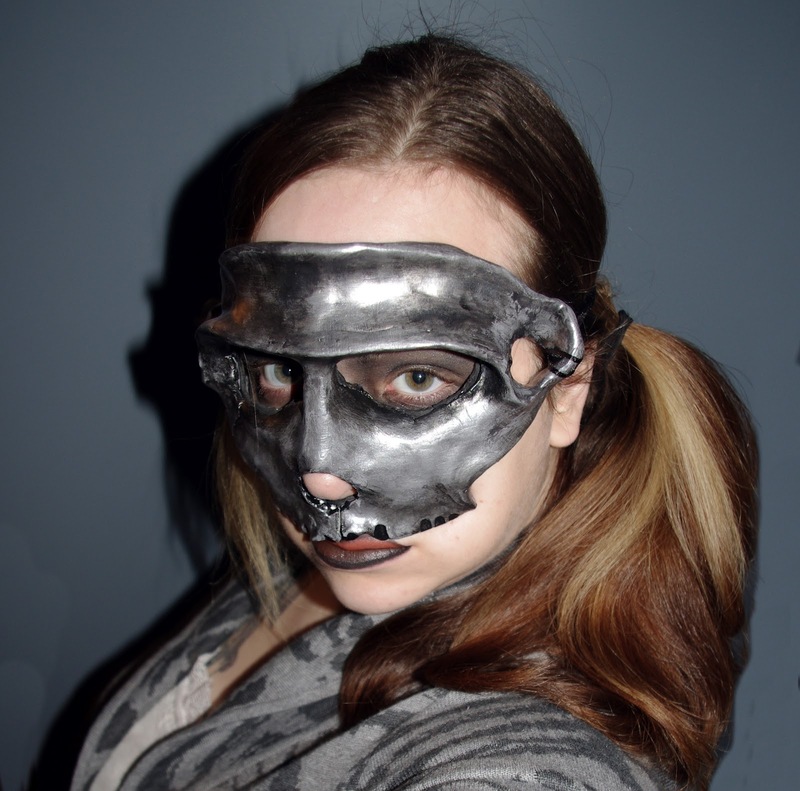 A friend of mine took an interest in my mask making and said she would love to see some creepy skull-like masks. Having never made one, I got to looking around at different animal skulls. 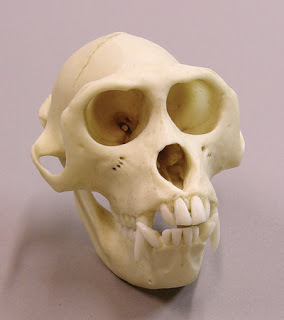 I found that a lot of monkey skulls are pretty interesting in terms of shape. While I don't think the result came out too creepy looking, I still really like it. The close resemblance to a skull makes it seem so primitive. I made the mask out of Sculpey polymer clay and referenced a picture of a Rhesus monkey skull (above) and just built it up from scratch on my face armature. The ear canal areas on both sides of the mask were a bit tricky to pull off with something as soft as sculpey but I managed. When this mask was done baking, I had to move it temporarily because the tinfoil armature it was baked on rolled a bit. The results were some cracks in the mask. At first I was very upset thinking of all the wasted time, but then I thought I might use it to my advantage. I super glued the cracks back together and held them to make sure they wouldn't release. The seal felt solid so I went ahead with painting it. I started off with a gray gesso and worked up my paint in many layers so that it would have a gun metal silver and black look. I darkened the areas that cracked as well and I loved the way it came out. I varnished it up and let it dry before the padding was added to the back of the mask for comfort. This is my first time using padding instead of felt, and I liked the feel very much. All that's left is to attach it the head for wearing! I used ribbon for the photo, but I will probably switch it to elastic when I get the time as it would be a lot easier to put on. This was a smaller project than most of my masks, but definitely a fun one. I may have to make some more of these in the future.